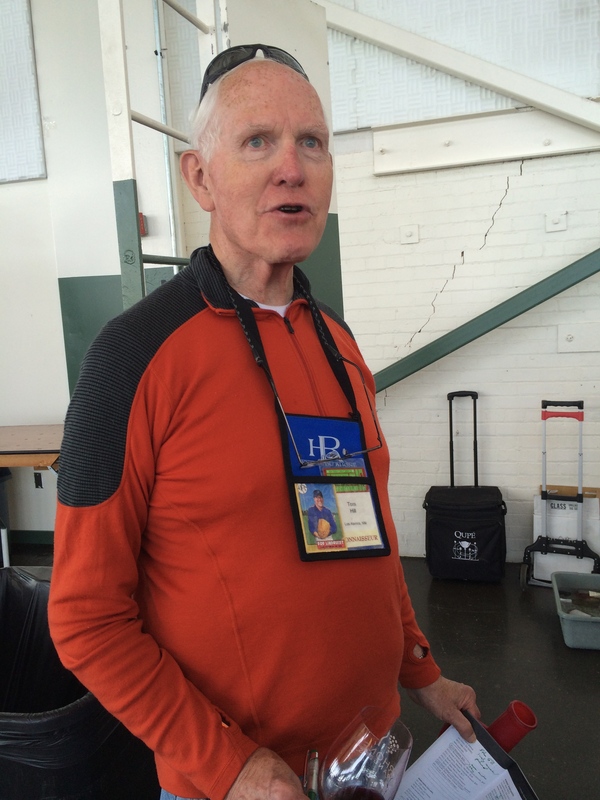 Tom’s undoubtedly schooling me in the history of Rhone varieties in the U.S.
At the 2014 Rhone Rangers event I had the pleasure of meeting Tom Hill. Tom is a wealth of knowledge when it comes to Rhone wines in the United States. He was there tasting the first Syrah planted in 1973 (a wine bad enough, he says, to set the Rhone movement back ten years) and he’s been there through the years tasting the best Rhone wines that California has had to offer through the years. He’s been helping Patrick Comiskey with his book on the American Rhone movement . Tom has been a great supporter of the blog and also introduced me to some of the most prolific and best Rhone producers in California. But, by far, the best thing that’s happened to me because I’ve met Tom has been my invitation to a special dinner that he put together with Steve Edmunds of Edmunds St. John Wines and Bob Lindquist of Qupe. Unfortunately, a few days before the dinner, as luck would have it, I got the stomach flu. After three days of not eating, I decided, that come hell or high water I was going to this dinner. I couldn’t pass up the chance, not only to try the special wines that Steve and Bob were bringing but also to meet Bob and Steve and also the other wine writers and aficionados who were invited. So that’s how it played out. I convinced myself that I was feeling better, put on a nice shirt and headed over to the east bay to attend what turned out to be the best wine event I’ve ever been to. Now, I did take some notes on the wines which I’ll include later but for this post I thought that it would be interesting to let Tom take the lead on this post. He put together his tasting notes and I think his preamble sets the tone and gives the background in a way that only he could. So, what follows are Tom’s words (slightly edited) on this dinner. I’ll give some of my thoughts at the end. Over the last few years, both SteveEdmunds and BobLindquist have been taken to the “woodshed” by Robert Parker’s Wine Advocate, for the decline in quality of their wines from their earliest efforts (twice in the case of Bob, first by Parker, then by Dunnuck). This is, of course, complete baloney. With their grape sources nailed down and the increasing maturity of their vineyards, they are making the best wines of their career. I suspect they were both sent to the woodshed because their wines are not big/flashy/extracted upon release and it’s only after some time in bottle that they start to realize their glories, mostly from the inherent balance they both possess. Unless you’ve followed their wines closely over the years, this is a trait that Parker & Dunnuck are clueless about. The wines were served in pairs. Many of the Qupes were from magnums. Before we tried the wines, Bob & Steve would say a few words about their making. After we tried the wines, Steve would get up and read the Parker review (kindly provided him by Patrick Comiskey) and its score. There would then be this wave of derisive laughter that’d sweep over the table at Parker’s obviously clueless screed. 1. Edmunds St. John Heart of Gold (Vermentino/GrenacheBlanc; 11.7%) 2014: Light gold color; very fragrant/perfumed/honeysuckle/Rouss/flowery/peach blossom slight stony/chalky nose; fairly tart bright/flowery/pear/Viog slight stony/earthy lovely flavor; a bit leaner & food friendly and not as ripe/blowsy as some previous versions but the same lovely aromatics. 2. Qupe Roussanne Bien Nacido Hillside 2011: Med.gold color; deep Rouss/honeysuckle/honeyed/floral slight stony light toasty oak quite perfumed nose; somewhat tart rich/structured Rouss/honeysuckle/pear light stony/mineral very light pencilly/oak; quite a good Rouss but I think this is going to be quite a profound wine down the road w/ 10 yrs of age or more; one of California’s greatest Roussannes being made. 3. Edmunds St. John Los Robles Viejos Rozet Vineyard/ Paso Robles (Viognier/Roussanne/Marsanne) 2003: Med.gold color; bit nutty/toasted hazelnuts/honeyed/waxy/figgy fully mature beautiful complex oldRhone nose; lightly tart smooth/velvety lightly nutty/toasted hazelnuts/earthy/spicy bit waxy/beeswax very complex/nuanced/elegant flavor. In its youth, this was a rather simple/pleasant enough white Rhone blend that spoke mostly of flowery Viognier. I was surprised by how beautifully it had developed into a lovely old Rhone. No signs of oxidation. 4. 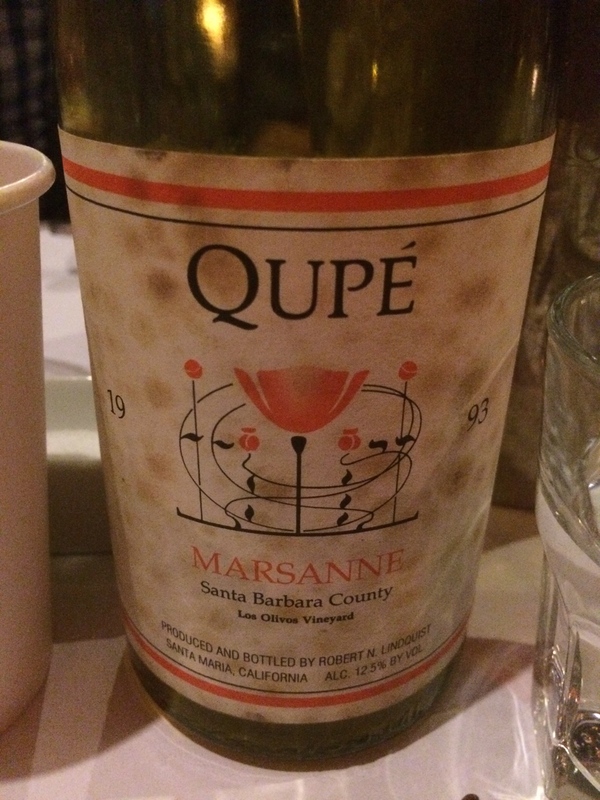 Qupe Marsanne Los Olivos Vineyard 1993: Med.gold color; beautiful nutty/toasted hazelnuts/honeyed bit smokey/pencilly light stony/mineral quite complex w/ slight oxidative notes; tart stoney/mineral some nutty/toasted hazelnuts/honeyed smokey/earthy slight oxidized bit metallic/tangy very complex flavor; a great example of what a profound/complex wine the Qupe Marsanne can evolve to. On one bottle, the cork plopped into the bottle as Bob started to extract it. The other bottle, with a sound cork, was a bit fresher and didn’t show any oxidative notes whatsoever. 5. 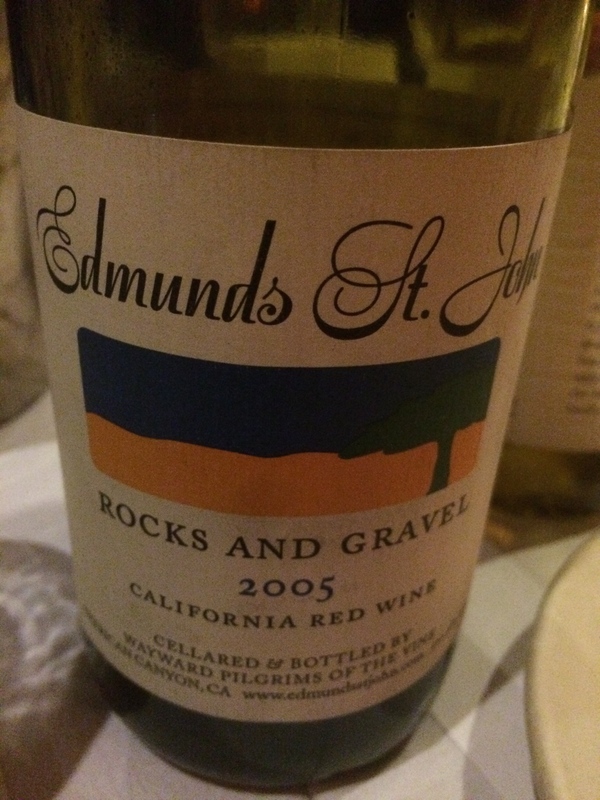 Edmunds St. John Rocks & Gravel 2005: Medium dark color w/ little bricking; very Rhonish/CdP-like some earthy/loamy light Grenache/strawberry/plummy/licorice some smokey/pencilly quite complex/Rhonish nose; soft/balanced light strawberry/Grenache/plummy fairly pencilly/smokey bit earthy/loamy/dusty/licorice flavor w/ light/gentle tannins; probably nearing its peak I would guess; a fully mature complex Rhone red. I find the R&G on release an understated/simple/not very dramatic red. But I’m always surprised how, w/ some age, they can rise up and bite you on the a$$ by how good they’ve evolved. This was another good example. 6. 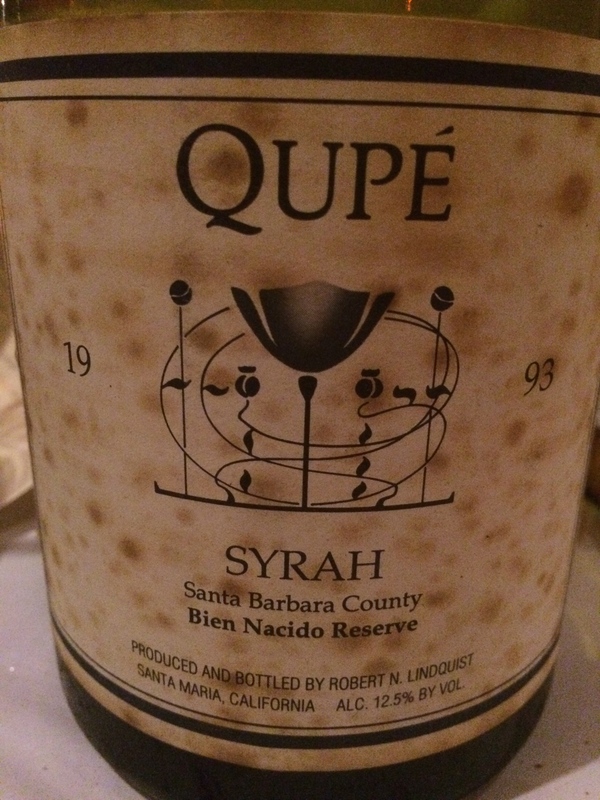 Qupe Syrah Bien Nacido Hillside 1998: Dark color w/ no bricking at all; classic mature Qupe smokey/pencilly/pungent/coffee some blackberry/Syrah/blueberry very complex beautiful nose; slightly tart/metallic very smokey/tobacco/pencilly/coffee/Rhonish some blackberry/Syrah/very spicy very complex flavor w/ light/smooth/velvety tannins; lots of pungent/smokey/Rhonish character and a classic example of a mature Qupe Syrah; should go out another 6-10 yrs I would guess. 7. Edmunds St. John Syrah Wylie-Fenaughty 2005: Dark color w/ slight bricking; Dark color w/ slight bricking; beautiful licorice/pungent/graphite/mineral/earthy strong plummy/blackberry/blueberry/Syrah complex perfumed nose; lightly tart slight earthy/mushroomy/truffly/ElDorado some licorice/pungent/graphite strong blackberry/Syrah/blueberry/plummy velvety/smooth textured complex flavor w/ some smooth/ripe tannins; a lovely Syrah that’s probably nearing maturity and shows some of that mushroomy/earthy El Dorado terroir. 8. Qupe/Edmunds St. John Syrah Auction blend 1995: Very dark color w/ no bricking; slight bretty/horsecollar/Rhonish rather blackberry/Syrah/blueberry/licorice slight funky/Rhonish complex nose; lightly tart bit bretty/leathery some blueberry/blackberry/Syrah/licorice some coffee/roasted/old Rhonish flavor w/ light/sharp tannins; a noticeable bret component that gave it a bit of Southern Rhone character. A special 50/50 blend of one barrel each that Steve&Bob did for the CentralCoastWineFestival auction. 9. Edmunds St. John BassettiVnyd/PasoRobles 2005: Black color w/ no bricking; beautiful cold-climate/black pepper/spicy intense blackberry/boysenberry/Syrah/licorice some smokey/Rhonish/espresso/roasted complex nose; rather tart very rich/mouth-filling black pepper/cold-climate intense blackberry/boysenberry/Syrah/spicy bit herbal/thyme structured some complex flavor w/ ample/smooth/ripe tannins; amazing youthful and sure to go another 10 years at least; my easy favorite of the Edmunds St. John. 10. Qupe Syrah Bien Nacido Hillside 1993: Dark color w/ no bricking; classic mature Qupe Syrah smokey/roasted/gamey/smoked meats pungent/espresso light blackberry/Syrah very complex aromatic nose; fairly tart/bit metallic very smokey/pencilly/roasted/roasted meats/gamey slight peppery/licorice some blackberry/Syrah/blueberry rather Rhonish/espresso/pungent very complex classic mature Qupe Syrah flavor w/ smooth/gentle tannins; as good as a Qupe Syrah can get and showing no signs of age at 22 yrs old; a beautiful Syrah that they would die to make on the HermitageHill. 11. Edmunds St. John Zinfandel Story Vineyard/Shenandoah Valley 1994: Dark color with slight bricking; some blackberry/Zin/Amador briary some earthy/loamy bit smokey/oak old Amador Zin/cedary/pencilly lovely complex nose; slightly tart light smokey/oak some Amador blackberry/briary/Zin rather pencilly/cedary light earthy/dusty smooth/gentle complex flavor w/ light/smooth tannins; probably a bit beyond its peak but holding up amazingly well for a 20 yr old Zin; probably just going to fade quietly away into the night. This wine obviously didn’t fit the theme of Wood Shed Rhones. Steve wanted to show it because Parker’s review thoroughly trashed this wine and he gave it a 74 or 75. What a laugher. 12. Qupe Marsanne Doux Sawyer-Lindquist Vineyard/Edna Valley 2012: At this point, I just decided to sit back and enjoy this dessert wine. It was intensely grapey/peachy and much like an Italian passito like a Caluso Erbaluce Passito. No evidence of botrytis that I could find. Bob only rarely makes a dessert wine, but when he does, they’re outstanding. His and Jim Clendenen’s ThumbsUp Riesling was one of my classics. This was one of the most special wine events I have ever attended. 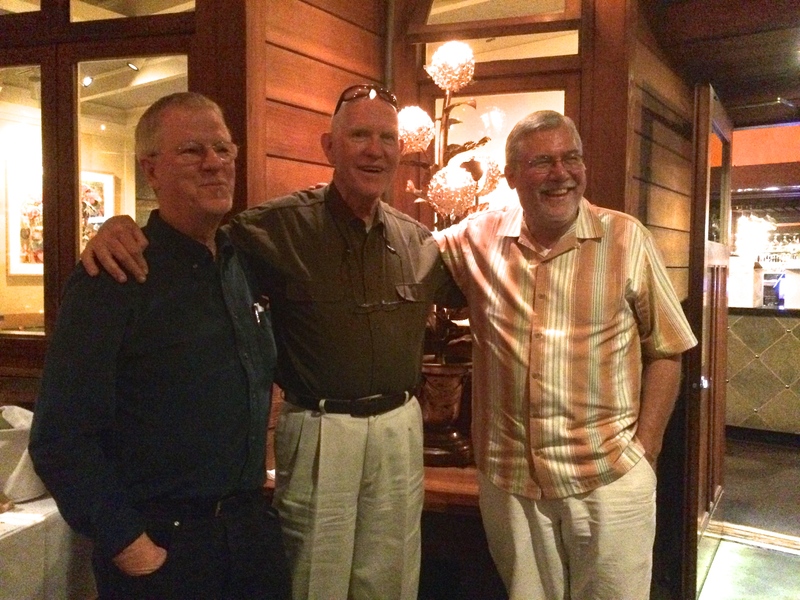 It was great to listen to Steve & Bob share their stories and their wines. There was much spirited and informative discussion the length of the table. A finer group of people could not be found. Across the board, all the wines showed extremely well. There were no wines that I felt were getting a bit creaky w/ age. They will all probably just quietly fade into the sunset and never really fall apart. Many California Syrahs, especially those made in a big/massive/extracted style, just keep “lasting” in the bottle…but don’t really show much evolution or develop much complexity (are you listening John Alban??). What is special about the wines of Bob & Steve is that they are ones that do develop complexity and nuance w/ age. I think it’s probably because of the balanced way the wines are constructed. Alas, it’s a lesson that’ll probably never be understood in Monktown. Many thanks to both Steve & Bob for generously sharing these bottles from their archives. It was a most special treat. And a special thanks to Michael Wild for fashioning a menu at Bay Wolf that allowed these wines to really shine. And much thanks to all those who attended this event and contributed many insightful questions & comments. We will, hopefully, repeat this event again in a few years afore a RR. So there you have it, I especially love Tom’s dismissive tone when it comes to Parker. One thing that many of us have learned over a time being involved with wine is that the age of the over-arching omnipotent critic is thankfully a thing of the past. Wine was always too complex and multi-dimensional for one voice to command it. It’s been a pleasure to get to know Tom and I especially love his open mind. I, too was most impressed with the wines. The wines, were all tasting great, with two exceptions. The first being that, as Tom mentioned, one of the bottles of the 1993 Qupe Marsanne was a bit oxidized because of a compromised cork but it did give the wine a rather intriguing nuttiness that the other bottle didn’t have as much of. The other exception was that the Qupe/ Edmunds Auction wine was too bretty for my tastes. I loved the mature Zinfandel too, a wine that Steve told us Parker had given a score in the seventies. It was a beautiful wine, elegant and refined after all these years. If I had to pick a wine of the night it would have to be the 1993 Bien Nacido from magnum. This wine was an elegant beauty, almost like a savory meal with notes of bright fruit to add complexity. What a wine. One of those wines that you feel privileged to have gotten the chance to taste. It was a special night. One that makes all those moments where sometimes I feel like this blog is a lone voice yelling into the wilderness, totally worth it. Those of us who are really interested in the past, present, and future of Rhone varieties in the new world excitedly await the annual Rhone Rangers event in the Bay Area. 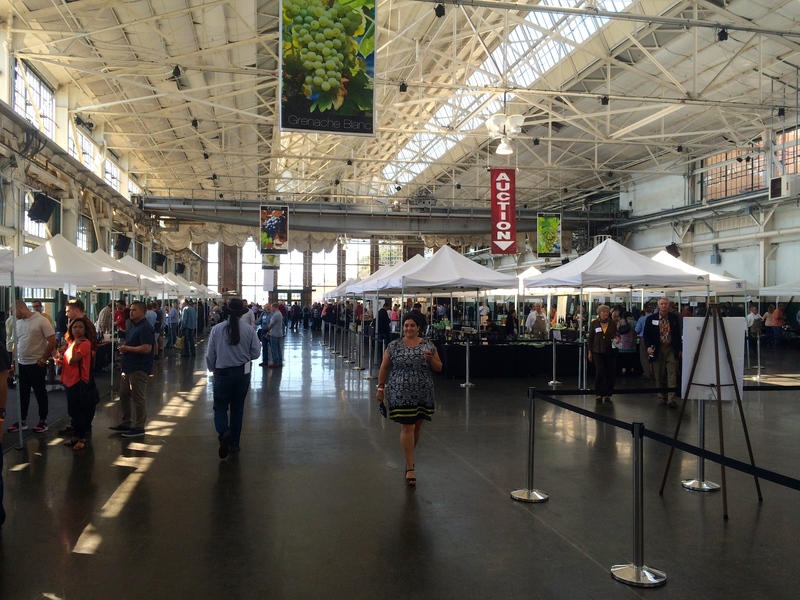 For the last two years the event has been held at the Craneway Pavilion in Point Richmond, California. It’s well attended but not overwhelmingly crowded. I was invited to attend the seminars this year and I was thrilled because one of the seminars was on how Rhone varieties aged over time and that’s always been a topic that interests me. The first event was all about Rose and although I really enjoyed tasting the diverse Rosé wines made from Rhone varieties, I’ll focus on the Syrah. Martin Redmond of Enofylz Wine Blog has written a nice post on the Rosé wines here. The second seminar was about how Rhone wines age and featured some intriguing wines. The first was a fabulous Qupe Marsanne that we tasted from a 2005 vintage and a 2013 vintage. The 2005 had this beautiful honey and hazelnut aroma that I could have sat and smelled for days. The 2013 was all bright and acidic and ready to drink on a hot day. Which was, in the end, a valuable lesson about Marsanne, while nice and gulpable in its youth but rather one-dimensional, a few years in bottle makes it a complex wine that demands contemplation. Next time I get a Marsanne from Qupe, I’m going to stick it in the wine fridge for as many years as I can stand it. But let’s get to the Syrah, this is why we’re all here after all. The next flight was a 2002 Lagier Meredith Syrah and a 2012. Lagier Meredith wines are known for their balance and structure which theoretically should lead to wines that age well. Carole Meredith mentioned that the 2002 vintage was one that for years was aromatically closed down and I’d have to agree on that. In her opinion the wine had come around but for me it was still lacking much of an aroma profile. I was impressed with its freshness though. I felt the 2012 to be more expressive with a little sweetness on the nose, some licorice, plum and a full mid palate with a big punch of tannins on the finish. The Lagier-Meredith Syrahs are elegant if a tad subtle on the nose. Wines 5 and 6 were a 1998 Sentinel Oak Syrah from Terre Rouge and a 2008. These wines were familiar to me because I had written a post about how oak influence can lessen over time. Bill Easton believes in a new oak profile of 25% and it’s very interesting to see how the wines, which are basically made the same year after year, change over time in the bottle. In my earlier post, I had noticed that in older Terre Rouge wines the new oak had lessened over time and this same scenario played out with these two wines. The 1998 was fresh still with an herbal savoriness and no hint of new oak while the 2008 came across as sweeter, with a soft finish perhaps brought on by its time spent in oak. Both wines were beautiful on their own merits but I prefer the older because I felt like that the lessened oak influence had brought out the savory side of Syrah that I enjoy so much. Wines 7 and 8 were from Silver Wines, which up until the seminar I had not heard of. Benjamin Silver is the winemaker and was a former assistant winemaker at Zaca Mesa. 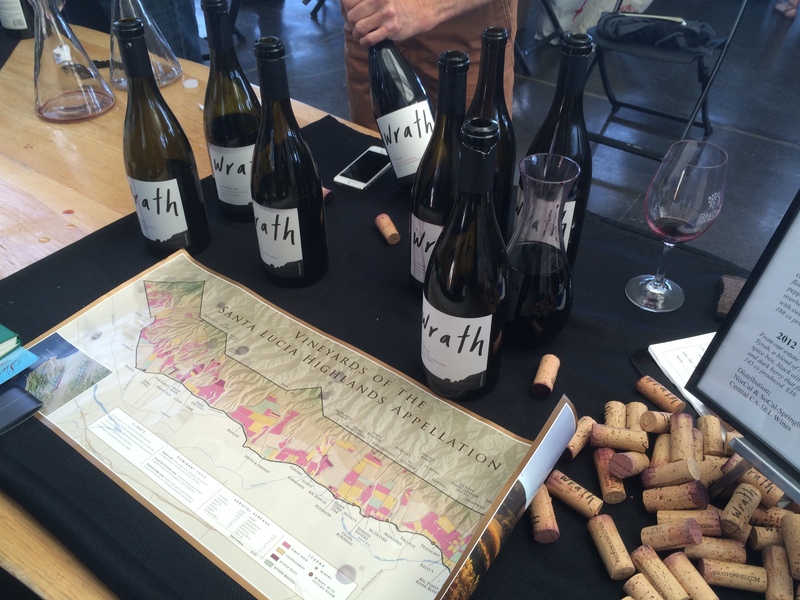 The wines were Syrah from the White Hawk Vineyard in Los Alamos. I’ve had a couple of White Hawks in the past and I’ve been impressed with their aromatic intensity but it has seemed like a vineyard that allows for some bombastic styles of Syrah and that was certainly the case with Silver’s 2003 White Hawk, which smelled beautiful but seemed to lack any mid palate structure. The 2010 on the other hand was very nicely structured and had all that I want from a Syrah: good freshness, structure and a savory and earthy undertone. The 2003 had a higher percentage of alcohol (14.7%) due to 2003 being a very hot year. I think that may have lead to its eventual lack of structure. I looked at this phenomenon of older wines made in a ripe style having a hollow midpalate and finish in another blog post here (link). Benjamin agreed that the 2010 (13% ABV) had a minerality and savoriness that the higher alcohol version did not. The following flight was a 2003 and a 2012 Tablas Creek Esprit de Beaucastel which is their Southern Rhone style blend. It’s mostly a Mouvedre-based blend but with a good amount of Syrah, Grenache and a little Counoise. The older version just seemed so knitted together and had developed an earthy and savory side. The 2012 was more linear, simpler, and more fruit forward. The last two wines were a 2002 and a 2012 Lytton Springs Petite Sirah from Ridge, a winery known for producing wines that age particularly well. This wine to me was the most obvious in showing how well wines can age. The younger wine was rather one note. It had a little of the fruit-forward rather non-distinct California fruit thing with a big tannic punch on the finish but the 2003 had developed into a beautiful savory wine that was very balanced. Wow, get a hold of some Petite Sirah from Ridge and just leave it in the cellar for as long as you can stand it. I’ll do it and put it next to my Qupe Marsanne. So, what can be generalized from this seminar? Rhone wines when picked at a balanced stage with the alcohol not being too great and with good acid structure, age very well. At least the ones in this tasting did. I haven’t really been a huge proponent of aging wines because you know, earthquakes and “seize the day”, but I have to admit that this seminar made me want to rethink my strategy. Almost without exception these were beautiful older wines and I think I might need to invest in a bigger cellar to accommodate some wines to age. First of all, I want to revisit some of my favorite Syrahs from the last year. Keep in mind that what I’m looking for at the Rhone Rangers event are Syrahs that have some freshness of fruit. I avoid wines that, in my opinion, were picked too late or lathered with too much new oak and have a gloppy, sweetness to them. Kieran Robinson’s Vivio Vineyard Syrah: Kieran wasn’t pouring his wines at this year’s Rhone Rangers. All the Terre Rouge Syrahs: Beautiful Syrahs meant for aging, consistent year after year. Two Shepherds Syrah: William Allen didn’t bring any Syrah to this years tasting but you can check out my review of his 2012 Syrah here. I tasted through his other wines and they were tasting fresh and energetic, with a core of savory minerality. Just how William likes them. Fields Family Syrah: The new vintage was tasting great, fresh fruit character with Lodi fruit. I also tasted a 100% whole cluster Syrah that was really good. Ryan is holding the wine back from the public but I think it’s one of my favorite wines he’s made. Donelan Wines Syrah: Donelan did not pour at Rhone Rangers this year. Qupe Syrah (these were my favorite from last year) I didn’t get a chance to check in with Qupe this year but these wines have been tasting great of late. MacLaren Wines: Steve Law continues to impress me with his food friendly Syrah. The Atoosa’s vineyard and the upcoming release of his “Bonnie Glen” Syrah are my favorites from his lineup. Lagier Meredith Syrah: I didn’t check in with Lagier Meredith this year (except at the aging seminar) but their Syrah is consistently delicious. Skylark Wine Company 2009 Rodgers Creek Syrah: I’m kicking myself for not tasting their 2010 that was offered at the tasting! Don’t know how I missed it but it’s a wine I need to search out because I really loved the 2009. This is a relatively new project of Macario and Griselda Montoya. They focus mostly on Rhone varieties with some Pinot thrown in. Their 2012 “Sangiacomo” Old Lakeville Vineyard Syrah is a site that’s situated right near Griffin’s Lair. There’s a delicious factor for this Syrah that can’t be denied. It’s all dark fruit and some powerful meatiness that’s characteristic of Syrah from that area. 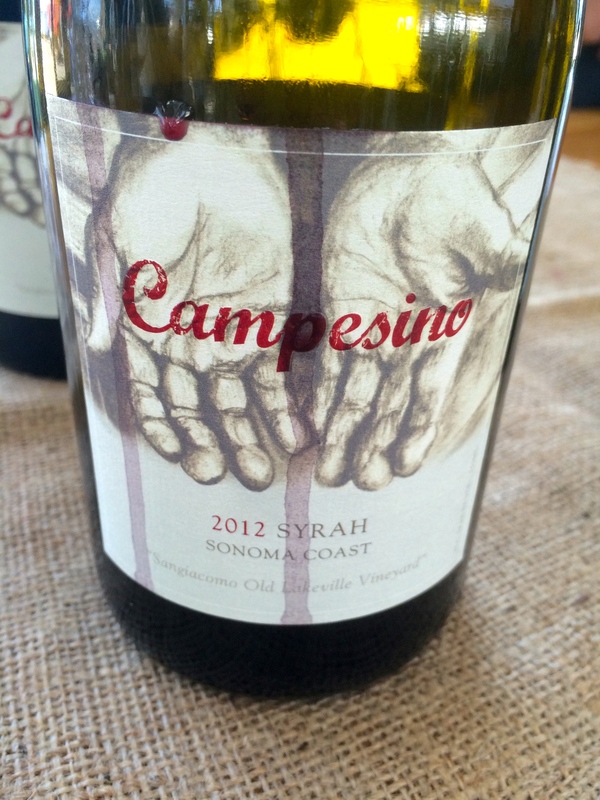 I look forward to trying more Syrah from Macario. Not exactly a new comer but Pax hasn’t poured his wines at Rhone Rangers for quite a while. He wasn’t there, unfortunately, but he sent an apt assistant who knew a lot about the wines. Pax’s 2011 line up of Syrahs were quite intriguing. I prefer his more food-friendly and fresher style Syrahs from his Wind Gap label but these were also delicious wines. Although the alcohol level was high, I didn’t feel that the wines were cloying (except for “The Vicar” which is Grenache based). All the Syrahs see 100% whole cluster which may have attributed to my perception of freshness. The Griffin’s Lair was the star for me with its meaty character but I also enjoyed his Alder Springs. Both these wines really are hedonistic bombs with lots of tannin but I was impressed with their freshness. The big surprise of the tasting for me though was Quady North. Their 2011 Steelhead Run Vineyard Syrah from Applegate Valley in Oregon was a spectacular example of the type of Syrah that I like. Savory, with nice black olive character, pepper, and a structured, fresh mid palate. Their other wines were also delicious and they had a pleasant and well-priced rosé at the rosé seminar. This is a winery I will definitely visit on my next trip up the I-5. The other winery that I was most surprised by was Wrath. I had tasted their wines the previous years and I wasn’t too impressed because the Syrahs seemed a little overripe. But on the a tip from the great Fred Swan of NorCal Wine I gave them another chance. I’m sure glad I listened to Fred. Their 2012 Doctor’s Vineyard Syrah was probably the most impressive of the wines, it had wonderful cool-climate character with an intriguing meatiness to it. I also liked the KW Ranch Syrah with its savory and earthy character. These are not exactly high acid, cool-climate Syrahs but rather rich and powerful with an elegance and a savory quality to them that I enjoyed. I’m glad I gave Wrath another chance. I know I missed some great Syrah at the tasting but, based on my sample size at Rhone Rangers, I think there’s a cadre of high quality producers making Syrah in the food-friendly style that I prefer. It’s possible that I’m just getting better at weeding out some of the big, bruising, blocky style that seemed omnipresent a few years back. Or, could it be that the pendulum is swinging back towards more balanced Syrahs that celebrate the variety’s savory minerally side? Time will tell and, meanwhile, Rhone Rangers will continue to be the can’t-miss tasting event of the year for me.